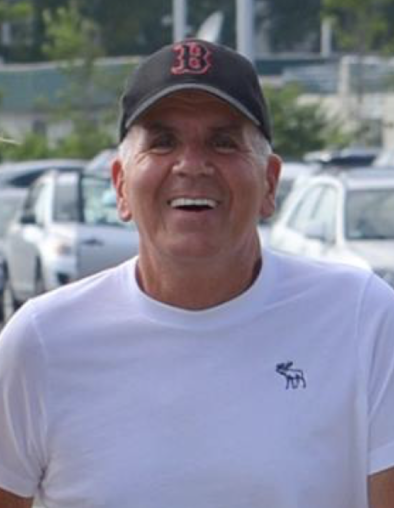 Frank V. Finocchio, age 61 of Brockton, formerly of Lynn died Thursday March 21st at the Kaplan Family Hospice House surrounded by his family, after a courageous battle with A. L. S. Frank is now part of Mass General Hospital’s Living Library as a donor for ALS research. Born in Boston he was the son of the late Guido A. and Clara J (Albano) Finocchio. Frank attended Lynn schools and graduated from Lynn English High School, Class of 1976. While at English, Frank lettered in Baseball and Basketball and was captain of the Baseball team. He was employed at the General Electric for 15 years, and was also a self-employed carpenter, and worked for several area contractors. He enjoyed staying active, playing golf and baseball. Frank was an avid Boston sports fan, but most importantly he enjoyed spending time with those he loved. Frank is survived by his daughter Katarina Finocchio and her boyfriend Joseph Pereira of Exeter, NH, two brothers James G. and his wife Lesley Finocchio of Peabody, Michael P and his wife Giannina Finocchio of Georgetown, one sister Annette M. Maguire of Byfield, his loving partner and caregiver Cheryll A. Branscomb-Leach, her three children, and four grandchildren, his former wife Heidi (Andersson) and her husband Robert Bodish of Danvers, his beloved dog Brix, and several nieces and nephews. Service Details: Visiting hours will be held at the Parker Funeral Home 35 Franklin St. Lynn on Wednesday from 4:00 – 8:00 PM, services will be held during visiting hours at 7:30 PM to which relatives and friends are invited to attend. Please make memorial donations in Frank’s name to the Kaplan Family Hospice House 78 Liberty St. Danvers, MA 01923.